← Keeping up. Not really. I just know you won’t want to miss out on this beautiful way to remember Benedict XVI and his legacy of service and love. 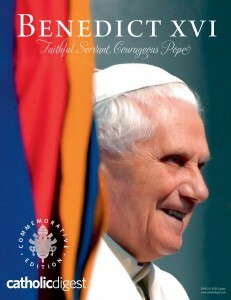 Catholic Digest’s commemorative edition, Benedict XVI: Faithful Servant, Courageous Pope, is a stunning, 8″x11″ – 56-page, special tribute that includes vivid photography, celebrated moments from the life of Pope Benedict XVI, and reflections about our beloved Papa, including farewell letters and drawings from children! This commemorative edition is a gorgeous and inspiring keepsake. At only $4.95 this booklet is a bargain and it would make a great Easter gift for yourself or anyone you love. Order your copy today. wow just $5-that is great! I will buy a few of them for Easter as you suggest. i love your writing. Hi there and God Bless. Very sorry to spring this on you but we have a very serious situation here! Ron Conte, I’m sure you’ve heard of him. Don’t listen to this man who mixes truth with lies!! He has made it very clear by flooding the internet and telling millions upon millions not to read or listen to or believe the messages from Jesus to Sadie Jaramillo and John Leary. Oh, and u won’t be able to contact me. The Hopi Indians have been waiting for the Blue Star! they also believe strongly in the bible. They say when the Blue Star arrives it will bring a Great AWAKENING and Great Purification, the same as our Warning and Chastisement. Jesus said: “My people, I have shown you visions of prepared caves before, but this one is lighted and tall inside and neatly carved by My angels. You will be drawn by your guardian angels to places of My miraculous protection during the tribulation. Know that I am watching out for all of My faithful in the least detail. You will see a religious persecution that will threaten the lives of My faithful and some will be martyred for My Name’s sake. Continue to pray for spiritual strength and be willing to go into hiding once the Antichrist is about to take over. You will not have to suffer long in My refuges, because the Antichrist will be defeated as he comes to full power in the world. Be watching for the coming comet of chastisement which will be My triumph over the Antichrist and Satan. Then all of the evil ones will be vanquished and removed from the face of the earth. Rejoice in My joy and peace as I will turn the world upside down. I have decreed a great day, in which a terrible Judgment will reveal the consciences of all men and they will be tested no matter what their religion may be. That day will be the day of change. WHAT WILL THE UNIVERSAL WARNING BE LIKE ? The universal WARNING will be a cosmic event unprecedented in the history of humanity, a phenomenon of unknown nature to science; according to many seers it will be like switching on a LIGHT from the depth of the Cosmos, that comes directly from God and that will have a great repercussion on earth for approximately 20 minutes, it will be visible to the human eye but it will also be an invisible force that will stir the conscience of men, causing in human beings a great emotional, psychological and spiritual shock, nevertheless it will not produce any direct physical damage; however, it could very well be defined as “the last effort from heaven” so that humanity will have a clear conscience of God and of sin, broadening the spiritual dimension and the understanding of the MAGNITUDE of the distance we have created from God because of our sins. In other words, this universal Warning will be a great test for the conscience of humanity, it will not be, however, something that will alter the course of the catastrophic events that we must confront, rather it will be an opportunity to change our view concerning this reality, being able to gain from it immense spiritual benefits. This event extensively revealed by God to many of His instruments around the world, is not actually widely publicly known, which at the same time not quite believable by others; undoubtedly the reader will ask himself why is that something of such an enormous magnitude has remained silent? Perhaps the response is because it has not been linked neither to science (because it lacks tangible elements) nor to religion (because of its private revelation nature) which at the end remains solely on men of faith. Some of the messages given by Jesus and Blessed Mary through chosen souls all through the years explain or have given some knowledge in details regarding its nature, and the effects that the human race will experience and the time in which this great Warning of God to humanity will occur. It should be mentioned that this knowledge is given to chosen instruments in the form of internal locution, many times accompanied by visions and also in mystical forms, that is to say, to experience the event in its human nature – spiritual, feeling in this way the effects that the Warning will create, thus providing the knowledge of its true magnitude. Many revelations have been known from authentic seers regarding this great WARNING of God to humanity for some time now, but it all started with the apparitions of Garbandal, where this subject matter has been transmitted to the five continents, having been understood in a more extensive context. Let’s see now a brief synthesis of one of the most extraordinary Marian apparitions of history. Garabandal is a small and humble town situated in a mountainous zone in northern Spain where even to this day retains the marks left by the presence of the Blessed Virgin Mary in the almost 3000 public apparitions between the years 1961 and 1965 to four girls between the ages of 11 and 12, Conchita, Jacinta, Mari Cruz and Mari Loli. There were many message and prophecies given to humanity by means of these girls; though it was the announcement of three great events of universal character that caused more impact at that time. These events have been announced by other seers and verified in other Marian apparitions and they are: THE WARNING, THE MIRACLE and THE CHASTISEMENT or Purification. According to the vision the girls said that this chastisement will be so immense as no other has been nor there will be in the face of the earth, it will affect the entire mankind, for that reason the universal WARNING and the MIRACLE will come beforehand to prepare us and it will be the final opportunity for conversion. THE MIRACLE at Garabandal will come shortly after the WARNING to confirm to the world that the WARNING came from God so there will be no doubt at all of its nature. That this Warning is linked to a natural phenomenon; that this name exists in the dictionary and it starts with the letter “A”. That the Warning is something that comes directly from God and will be seen throughout the whole world at the same time. That it will be like a revelation of our sins and it will be seen and experienced by both the believers as non-believers and by people of all religions. That the Warning is like a cleansing of our sins in preparation for the Miracle. That is also a type of cataclysm, which will make us think of the dead; that is to say, that we would wish to be among the dead before experiencing the Warning. That this Warning will be a correction of the conscience of the world, and for those who do not know Christ, that is, those who are not Christians will believe that it is a Warning from God. That the most important thing of that day will be that every one in the world will see a sign, a grace, or a chastisement within themselves. In other words: a Warning. That they will find themselves at that moment alone in the world, no matter where you might be, you will be by yourself with your conscience in the presence of God. You will see all of your sins and what your sins have caused. That each person will feel this event in a different way because it will depend on the individual’s conscience; since the sins are different from one person to another. The Warning will be linked to an astral phenomenon, as if two stars collided with each other; that this phenomenon will not cause physical damage; but it will frightened us, because in that precise moment we will see our souls and the damage we have done; it will feel as if we were dying, but we will not die because from it, although it is possible that we could die of fright or from the impression of seeing ourselves and what we are internally. These revelations given in that small village coincide with many others that have been given during a long period of time throughout the whole world having been able to verify that said WARNING will come as the final warning for humanity, which will be deeply submerged in a planetary crisis. The following is the story of the seer, Luz de Maria de Bonilla, who has been receiving these messages for over 17 years from Our Lord Jesus and Our Blessed Mother, prophesizing and warning humanity about dramatic events, many of which have been fulfilled with exactness, she counts with a group of priests that accompany her, she remains anonymous by Jesus’ mandate until He says that her identity be known publicly, nevertheless due to the celerity of the events many of the messages are made known to mankind by Our Lord’s consent. The following is the story that she conveys to us regarding her personal experience of what the Universal Warning will be like. “In a very special way, our Lord has given me to understand that a comet will come near the earth, all of humanity will see it, which will create panic and compel many people to go to confession, but not for repentance. In the sky there will appear a sign, “A CROSS” for several days, people with faith will feel the need to confess their sins, to repent; the remainder of the people will say that it was brought about by men and will turn against the Catholic Church, saying that it is a trick to frightened humanity. I felt in my being anguish, as though something was coming closer to me, but I could not tell what it was…, like something frightful, something distressful that I couldn’t figure out, though I knew something was going to happen. It was something that made my heart beat rapidly. I was in this state for around 20 minutes; then the anxiousness began to increase, I started to feel as though my soul was leaving me, because little by little I felt a terrible loneliness that was not only filling my spiritual being, but my physical body as well. Then I felt a dreadful loneliness. The anxiety had me walking to and fro because each time the loneliness grew greater. I was totally aware that God was not in my being; my soul was desolated, anguished. I walked seeking consolation and could not find it; the loneliness, the emptiness was greater each time, until the point of feeling I was going out of my mind, my soul was left without God! And as in a movie, all the sins started to weave within me, perhaps the gravest that men could commit: I felt or I should say, was experiencing everything because I felt them as my own, I was living them. I felt what goes through the mind, through the heart, in the interior of the people who take their life. I ambled desperately feeling God’s abandonment, it was really terrible and then I remembered that my husband did have God, so I looked for him and found him in his bedroom and I said to him: !Please lay your hands on my head, I need you to pass God to me, because he has abandoned me! My husband, afraid, did not know what to do and asked me: What’s happening to you? And I responded desperately: “I don’t have God, He is gone, please, pass Him to me.” My moans were actually coming from deep within my being and he asked me, “What prayer should I say?” And I responded: “Doesn’t’ matter what, just pass God to me. This was truly a devastating and bitter experience. He prayed, but I still felt the emptiness. I think I was tempted by the demon to leave my house, get into the car and look for one of the priests, but somehow I knew that if I left the house, it could be fatal. And then I threw myself on the floor with my arms extended in the form of the cross and begged God to return to me. At that moment, my soul spoke to me! I knew it was my soul, and my soul said some words, that I kept repeating as she said them to me and I felt that the Holy Spirit was filling me. I started to feel invaded with a sense of peace that I have never before had experienced; a peace that satisfied, that fused me. My chest was bursting; then I felt something physical stayed within me; a presence that I still feel to this day and which surrounds my whole chest. That’s how the WARNING is going to be. That is why the people who have sins will be out of their minds, and the demon will be waiting, will induce them to take their life, to take them as its own spoils before the hour of mercy comes. The WARNING will be for those who are not with God be a terrible moment, unbearable in which they would end up placing themselves in the hands of the demon, who with its demoniac legions, will encircle the souls and accuse them of their sins in which they live and tell them that God will not forgive them. For those who are lukewarm, it will be the moment of repentance, of grace, because when they understand their error, they will ask forgiveness and will convert, and for those who are in grace, they will be filled with the presence of the Holy Spirit. We know that after the WARNING, those who do not believe will give it a scientific explanation, so that humanity will continue in error, sin will increase and there will be persecution. From that day on my life has not been the same. God, during the WARNING, will make us aware of sin. I will never forget that day. I cried in those moments in which I did not feel God, I couldn’t even think because the absence of God surpasses everything; I only felt emptiness and felt in my flesh the sins that came one by one, increasing the anxiousness and the loneliness. At the time of writing this message and whenever I talk about it, I cry; I cry because even just the memory of it hurts so much, and I always ask Our Jesus not to let me feel it again, because I think I would not be able to endure it one more time. The experience of the WARNING that I had through the message of Mother Mary a short while ago, was similar to the previous one; only that the former had such an intensity that each sin, which passed before me had its respective degree of offense to God, the pain that God feels and the burden towards all of humanity. It was a TOTAL abandonment of God, not only at a personal level, but at that same time I also felt the pain of the cosmos in general, to see God removed from Its Creation by the human will. At that moment Jesus let me feel what we will experience during the WARNING: “THE ABANDONMENT OF GOD”. NOT BECAUSE GOD WANTS IT, BUT BECAUSE IN THAT MOMENT GOD, RESPECTING THE FREEDOM OF MEN TO USE THEIR FREE WILL, WILL LET THEM SEE THE CONSEQUENCES OF THE ABUSE OF SUCH FREEDOM, SIN. Both experiences are similar, however the one from Lent I know it came from the Blessed Trinity and the intensity was much greater, although in essence it was the same, and the one of the previous message came from the pain of Our Mother that according to my understanding, are only one, because the Blessed Mother is the Trinitarian precinct. That is why to distance yourself from God, is to distance yourself from the Mother. Both experiences have been very strong, but more so the first one, although I wouldn’t want to experience either one of them again. Perhaps due to these merciful experiences, is that I try and struggle not to fall into sin and I go to confession as often as possible and it hurts me to offend Our Jesus, because I don’t want Him to find me offending Him. FROM WHAT JESUS HAS TOLD ME REGARDING THE WARNING, THAT IT IS FELT TOTALLY WITHIN OUR BEING. THERE WILL ALSO BE A PART THAT WILL BE AT THE COSMIC LEVEL BECAUSE THE WHOLE COSMOS WANTS TO PURIFY ITSELF, BECAUSE IT HAS BEEN CONTAMINATED BY THE SIN OF MAN. THE CREATION THAT IS IN TOTAL CONCORDANCE WITH THE BLESSED TRINITY WANTS TO FREE ITSELF OF THE CONTAMINATION THAT MAN HAS INFLICTED UPON IT. I know very well that Our Lord gives us always three opportunities, the third time that I will go through it will be the WARNING and I implore the Heavens above that I will be prepared for this grace. After the two experiences regarding the WARNING, although as I mentioned before the first one surpasses the one that I shared with the message of Mother Mary; the vision and the experience always feel as it were the first time and perhaps because the one of 2008 was felt at the cosmic level; the one of today was more of the human level. Whenever I see Jesus and He talks to me, it is as if it were the first time and I live it with great intensity. The same is with Mother Mary, each revelation is as if it were the first time; it is a total Divine love. No one can really get accustomed to see, to like, to live in the Trinitarian Love and the Maternal Love; at least not me. Each occasion is truly like the first time. As we previously mentioned the way heaven gives knowledge to many chosen souls, Luz de Maria has made known to us her mystical experience in regards to the WARNING, an extraordinary experience, a very painful one, but one that allows us to understand the dimension of this future universal event soon to come, that it is convenient to deepen and understand it in our interior. Those who are aware of the delicate planetarium situation in the nature of things, will know, not only by a simple logic but also internally, that to arrive to a realization of universal conscience by a typical human mean, to take on new dimensions immediately of men’s way of thinking and acting, amidst the uncontrolled morality, the lack of altruists values, the lack of faith and the massive plan of disruption, would be nowadays an utopia dealing with the dramatic events that we are living, therefore, a logical possibility remains and that is DIVINE INTERVENTION, which will give an enormous opportunity to the whole of mankind to stop in the course of their lives and maintain their eyes on the Creator. “The day will come that men will attain great graces. A great miracle of God will transform the hardened hearts. Each one will see their errors and will receive the grace of repentance. This will be the great opportunity that our Lord will give His children who have separated from Him”. “A Warning will be given to you and your soul shall reveal like in a mirror what you have been during your whole existence”. “Something is coming to the world, something very grand. It is not the end of the world; it is the beginning of the conversion of many souls”. “The great light of God will soon descend upon the world, there will be great weeping and many will flee, trying to hide its shame before God”. “A sign will come for which all of humanity will experience the external knowledge that God exists, and they will know that it comes from God; everyone will see themselves as they really are”. “I will give a Warning, I will perform a miracle, everyone will see it, but humanity, except for a very few, will continue to doubt. I have appeared in many places in the earth, but few believe”. “Before the chastisement God will send a Warning, and for no one to have any doubt there will be a Miracle”. “When everything seems to be hopeless a Great Miracle will occur, as the final effort from heaven, to save souls”. “I will bring a great Light that will illuminate all the souls. But it will be too late for those who do not understand a Mother’s love. Everyone will be in the center of a grand Judgment”. “I am the good shepherd, and my sheep know my voice.” I laid down my life for you, and for all…for LOVE…I am LOVE incarnate….but few are they who return that love….I find great consolation in the hearts of those who do love me, for the many who do not. See I have heard your prayers; I have heard your supplications, I have received your tears. But look and see what I see….desolation of souls…desolation of love…desolation of marriage…desolation of the youth….desolation for lack of knowledge of my LOVE. For there shall be then great tribulation, such as hath not been from the beginning of the world until now, neither shall be. And unless those days had been shortened, no flesh should be saved: but for the sake of the elect those days shall be shortened. Then shall the kingdom of heaven be like to ten virgins, who taking their lamps went out to meet the bridegroom and the bride. And five of them were foolish, and five wise. But the five foolish, having taken their lamps, did not take oil with them:  But the wise took oil in their vessels with the lamps. And the bridegroom tarrying, they all slumbered and slept. And at midnight there was a cry made: Behold the bridegroom cometh, go ye forth to meet him. Then all those virgins arose and trimmed their lamps. And the foolish said to the wise: Give us of your oil, for our lamps are gone out. The wise answered, saying: Lest perhaps there be not enough for us and for you, go ye rather to them that sell, and buy for yourselves. Now whilst they went to buy, the bridegroom came: and they that were ready, went in with him to the marriage, and the door was shut. But at last come also the other virgins, saying: Lord, Lord, open to us. But he answering said: Amen I say to you, I know you not. For most of my people (in these days) are wasting away in the vile sins and filth that has inundated this nation and the world, (but) the plots of those evil societies will be thwarted by Divine Intervention. The time of extreme punishment is upon you, but be not afraid for I am with you…My Mother leads the remnant through the final phase of these trying times. I am asking you to live an intense prayer life in these days…and it is not the length of prayer..but the meditation and knowledge of what is being prayed with every beat of the heart. And my Mother will (once again) be able to bring a swift end of this trial, for the Trinity where She dwells cannot say no to the Queen of Heaven. It is for the sake of those who pray, cry and lament over the state of this nation that Divine Intervention will prevail. But again I repeat, I AM COMING, AND I AM COMING WHEN MY PEOPLE LEAST EXPECT IT, SO THEREFORE BE VIGILANT AND AWAKE. (I was interrupted here and it was Saturday the 20th of April in Eucharistic Adoration that Jesus gave me the completion)…. I have heard your prayers, in the stillness of your soul….I AM. When u first see him, TURN YOUR TV’S OFF!! RADIO;S TOO!! Don’t even think about listening to him for a little bit, OR YOUR GOING TO LOSE!! If you let your curiosity get the better of you, YOUR GOING TO LOSE!! If ya wanna take, just a little look see at the miracles he’ll perform, YOUR GOING TO LOSE!! That’s how powerful this evil jackass is gonna be. He’s coming as a man of peace and will turn into a horrifying monster real quick. With in three and a half years! With all Governments and police officials on his side, forcing the mark of the beast, a computer chip on the hand or forehead or you will not be able to buy or sell. Money will soon be worthless! ALL YOUR TRUST HAS TO GO TO JESUS MARY AND JOSEPH AND ALL THE SAINTS!! with all your heart and soul and with every decision from this point on OR YOU WILL LOSE!!! THAT’S HOW SERIOUS THIS IS!! If you sit and read these messages and wait to see if this is true or not YOUR IN GREAT DANGER OF LOSING!! If you read these messages and don’t pass them to other websites and other church’s of different denominations YOUR IN GREAT DANGER OF LOSING!! I CANNOT STRESS ENOUGH HOW SERIOUS THIS IS!!! This stuff is NOT NEW!!! I could go on and fill the forums around the world with this stuff. Jesus/Mary are very upset to say the least as to how the Christian world has knocked down all these messages…like FOREVER!! IN EVERY WAY POSSIBLE. Ok,thats it for me. You need light for the Three Days Of Darkness! because nothing will work, no batteries no flash lights no solar lights, not even regular candles. ONLY BLESSED CANDLES WILL GIVE YOU LIGHT (*) and you need other stuff too! Stuff that JESUS AND MARY HAS ASKED US TO GET!!! NOT WHAT PEOPLE ARE TELLING YOU TO GET!!! LISTEN TO JESUS AND MARY!! It is from a secular site who knocks down the idea that something is coming. Take a very close look at the top Hubble photo…How can anybody not see what I’m seeing, a super ugly dragon beast looking directly into a part image of mother Mary holding baby Jesus! U either have to be blind stupid or evil not to see this!!! Ok, on the first comments page I posted as toni maybe a year or so after this site went up. I say this might have something to do with the Warning! ( if ya ever looked into this stuff through other photo’s, the pattern of stars are formed in a circling backward’s C like in the letter C.And now a year later Jesus through the messages to John Leary CONFIRMS WHAT I BELIEVED in the message from May 7 2013 … In the vision of the circling stars, you could tell that this was connected to the Warning. Once the Warning occurs, events will be moving quickly to allow the Antichrist to come into power. This is the best I can do!